I found this little full-color, illustrated gem at a local Goodwill and while I was thrilled at my luck, didn't realize at first just how cool this book really is. 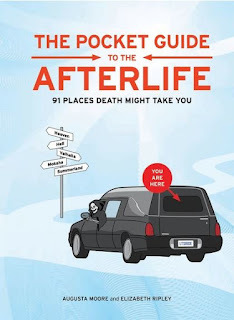 The Pocket Guide to the Afterlife features 91 different religions from all corners of the globe and gives a brief overview of that religion, breaking down in somewhat greater detail what each religion says about that age-old question: "Where do we go after we die?" Being a paranormal investigator, I assumed this was going to be a handy reference guide for when we deal with clients of varying beliefs and backgrounds. I am a firm believer that you cannot offer your client the best and most effective course of action unless you really understand what is going on through THEIR perspective...and while arguably religion has little to no place in scientific investigation, religious beliefs undoubtedly help shape a client's perspective on what is happening to them. What I didn't realize was how profound of an impact this book would have on me personally. For a cute little book filled with somewhat goofy pictures and very brief synopses on some truly unique religions, I got a lot out of it! Granted, I don't foresee too many Zoroastrians coming to us for help with their paranormal problems, but it was really cool to compare how religions that are light years apart can have such similar belief structures when it comes to the afterlife. There were several cases where different religious interpretations of the afterlife even seemed to accurately explain some of those universally held paranormal ideas that so many people just accept as fact without ever questioning where that information originally came from! Of an even more personal nature, this book really sparked a lot of internal dialogue and thinking within myself. Reading through the different belief systems, I kept finding examples that closely fit in with my own belief systems...which up until this point I sort of gave a very non-committal 'agnostic' title to. It really got me thinking about my own beliefs, my own religion, and most importantly, the idea that so many people falling into the middle (or just having beliefs that reflect some, but not all, of the tenets of various religions) must mean that NO ONE has gotten the whole religion thing 100% correct yet! That's a pretty deep emotional response for a book that is largely supposed to be a quirky and humorous novelty book! Even if you're already deeply rooted in your belief system, this is still a great little handy reference to have on hand and its a quick and fun read. I definitely learned a lot that I didn't know before and have a whole page worth of notes to research for further information. This book is a great little addition to any paranormal, religious, non-fiction, etc. home library!